As a first chapter children’s book, this little book is more than meets the eye. 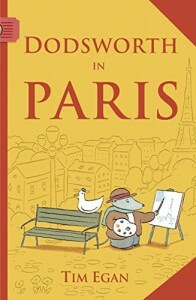 It has lovely illustrations, and sufficient information about Paris to make the book authentic. That’s a terrific background for a children’s book about a talking duck and a ??? I am not sure what Dodsworth is. He has a long nose, but he wears clothes, so he could be a badger, or any thing. Make him what you want. I checked this children’s book out for a second grade student who was headed to Paris to visit his grandmother. I thought it was a delightful way to introduce a foreign country to a young child. The sentences are short, and the story is simple and silly. I gather my student liked it, as he then asked his folks to get the other Dodsworth book, Dodsworth in New York. There are also at least two other books like this, based in London, and Rome. I would like to mention the illustrations once again. For a new reader, having illustrations that relate to the text can help the reading process. There is a lovely half-page illustration on each page of this children’s book, making it very accessible for new readers. In our continued search for a good first chapter children’s book, this one definitely makes the grade, with it’s lovely combination of silliness and fact. It would also make a very nice read-aloud book. It’s very short and easy to get through in one sitting. Bonus – your young child will learn a few phrases in French!